This Contract will only and exclusively be valid for the Property and the Stay Period identified in the first clause of the Property Vacation Rental contract. At the time of making a reservation, a first payment (deposit) must be made corresponding to the 50% of the indicated amount in the second clause, which is the payment amount for the entire stay. The balance amount should be made at least 30 full days prior to the Tenant’s arrival. If the balance due is not paid on such date, the Landlord reserves its right to cancel the reservation and the cancelation conditions detailed below, will apply. If the reservation is made within 30 full days prior to arrival, the entire amount for the stay is required. Any late payments made to the Landlord will incur an additional administrative charge of US $50.00 (fifty US dollars) and/or the cancelation of such reservation and the loss of the first payment made. Payments deposited directly to one of the Landlord’s bank accounts, will not incur any charges. All payments made from abroad must include any international banking charges. In the event that the Tenant wishes to proceed with a cancellation, the Landlord must be notified in writing (e-mail) and signed by the person who made the reservation and the notification will be effective as of the date that the Landlord receives it. If the notification is received before 60 full days prior to the beginning of this contract, the Tenant will be reimbursed the total amount of the first payment less an administration charge of US$200.00 (two hundred US dollars). If the notification is received before 30 full days prior to Tenant’s arrival, an amount equivalent to 50% of the total of the first payment received will be reimbursed to the Tenant. If the notification is received within 30 full days prior to Tenant’s arrival, no reimbursement will be made. No cancellations apply for Christmas and New Years. On the improbable event that is necessary to cancel the reservation by the Landlord, due to unavailability of the property reserved to be rented and it wasn’t possible to offer to the Tenant an alternative with equivalent conditions and characteristics, the Landlord will reimburse the total amount previously paid. In the event of changes or cancellations due to Major Force Causes, because of acts of war, riots, civil commotion, strikes, disasters, terrorist acts, bad weather, actions of any government or public authority, or any other event public or private out of the Landlord’s control, the Landlord will not be liable in any form or way. The Landlord reserves the right to modify or remove any reservation due to circumstances out of its control and won’t be liable for any lost, expenses, inconveniences and/or claims for any cause. Landlord’s liability will be limited to reimburse any previously paid amount. It is strongly suggested to purchase travel insurance, since the Landlord will not be responsible for medical expenses, repatriation expenses, property loss or damage, civil liability, personal injuries, or any other expense, loss or damage that otherwise, would be covered by a travel insurance policy. The Tenant is required to give a security deposit to cover possible expenses caused by damage, loss and/or abuse of the property, its contents, its accessories, furniture, appliances and/or equipment. The security deposit will be determined according to the period of stay and the property in question. The security deposit should be delivered at the moment of arrival and it will be returned at the moment of leaving the property, once a physical inspection of the property has been made, and it has been determined that the Property is being received in the same good conditions and cleanness as it was delivered to the Tenant. The Tennant will be responsible for the full costs spent for repairs or purchases of any object(s) to be replaced due to negligence, abuse, accidents, losses and/or damages. The Landlord should be notified immediately of any damage, loss or malfunction, with the understanding that by not doing so, would be enough reason to hold the security deposit. Under no circumstances should the maximum number of persons allowed, specified on the Landlord’s webpage or specified on the reservation form be exceeded. Some properties exclude electricity or include only some kwh during the stay. Rate depends on the property location and is published on property description. The unauthorized excess of person(s) at the Property might result on extra charges, penalties and/or immediate cancelation of the right of stay at the property. The Landlord reserves the right to terminate the Tenant’s stay at the Property due to bad behavior or misconduct from any of the occupants, their guests, and/or for not following the Condominium Internal Rules of the Property’s complex. The Property is equipped and furnished for the Tenant’s service and the amount of persons established on the reservation form, and will be inspected and cleaned prior to arrival. The Landlord reserves the right to retain any amount from the security deposit to cover any additional cleaning expenses. The Tenant does not acquire any right of any nature, over the Property but its use and enjoyment only during the specified period of stay. The Property cannot be subleased, nor lent , either fully or partially. The Property should be kept locked during the night and whenever the occupants leave the Property alone. The Tenant acknowledges to act in such way that no unacceptable disturbances to condominium residents or neighbor properties will be caused. The Tenant acknowledges that if the reserved property is in a condominium complex, the Tenant thereby accepts that the Landlord is not responsible for noises or disturbances that neighbors or occupants of such condominium might cause, nor will the Landlord be responsible for noises or disturbances caused by the city’s normal operations The Tenant acknowledges that the circumstances described above are out of the Landlords control. The Property will be available to be occupied from the 15:00 hrs. on the day of arrival and it should be vacated by 11:00 hrs. on the day of departure. In the event that the Property is not available at the agreed upon time, the Tenant might be able to leave its belongings inside the property and will allow that the cleaning staff to finish its work as soon as possible, by leaving the property temporarily unoccupied for this purpose. In the event that the Tenant would like to leave the Property after the time established previously, the Tenant should be requested at its arrival, which does not mean nor should be understood, as an obligation or commitment of the Landlord. The Landlord reserves the right to retain additional charges from the security deposit, if the property is still occupied after the time previously established. 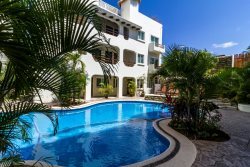 The Tenant, other occupants and guests will use the common areas and swimming pool under their own risk and will be at all times responsible of their own security and safety, as well as its guests. The Tenant is responsible to be informed about the rules, specifications and safety precautions that apply at the common areas and swimming pools, before using them and to observe and obey such applicable rules. No pets are allowed at the Property, unless previous written authorization is obtained from the Landlord. Unless specified otherwise, property vacation rental includes utilities expenses, such as water supply, electricity, domestic gas, bed linens and towels. In the event that other supplies are required, they should be requested and paid prior to Tenant’s arrival. All information supplied and pictures by the Landlord’s staff and through the web page, is as exact as possible according to the conditions that properties are found in. The Tenant acknowledges that some characteristics might change, due to reasons out of Landlord’s control, therefore the Landlord promises to inform the Tenant as soon as possible about the situation, and will not incur in any kind of liability. The Landlord will not be responsible or liable in any way or form, for wrong interpretations of the graphic and/or written material at the Landlord’s web site, since all photographs and information presented there are real. The Tenant should understand that the provided furniture, accessories and/or appliances may not be the same shown on the website due to changes made by the property’s owner and not communicated to the Landlord. Construction works and/or repairs at neighboring properties, may result in dust and/or noise disturbing for the Tenant at any time of year, therefore the Landlord will not be responsible in any way or form in such event, nor will the Landlord be liable for the temporary cancelation of public and general services, such as water, electricity, cable, satellite, internet, telephone, etc., caused by reasons out of the Landlord’s control. It is strictly forbidden to smoke inside the Property, therefore in the event of the Tenant doing so, the Landlord reserves the right to retain the security deposit for the expenses incurred in the removal and cleaning of all toxic odors. Este Contrato será válido únicamente y exclusivamente por el Inmueble y el período de estancia indicado en la cláusula primera del contrato de arrendamiento. Al momento de realizar la reservación se cubrirá un primer pago correspondiente al 50% de la cantidad citada en la cláusula segunda que corresponde a la contraprestación por el período de estancia a reservar. Ningún contrato o acuerdo tomará efecto hasta que el Arrendador reciba esté depósito inicial y confirme la reservación. El saldo deberá ser cubierto al menos 30 días naturales previos al arribo del Arrendatario. Si el saldo no es recibido en la fecha estipulada, el Arrendador se reserva el derecho de cancelar la reservación y se aplicarán las condiciones de cancelación previstas más adelante. Si la reservación es hecha dentro de los 30 días naturales anteriores al arribo, el monto total de la estancia deberá ser cubierto al reservar. Cualquier pago que se efectúe tardíamente al Arrendador incurrirá en un cargo por administración de US$50.00 (cincuenta dólares moneda de curso legal en los Estados Unidos de América) y / o la cancelación de la reservación y la pérdida del primer pago efectuado. Pagos depositados directamente en alguna de las cuentas bancarias del Arrendador, no tendrán cargos. Todos los pagos que se efectúen desde el extranjero deberán cubrir los cargos bancarios erogados. En caso que el Arrendatario desee hacer una cancelación, esta deberá ser notificada por escrito (Fax, Correo certificado o correo electrónico) y firmada por la persona que hizo la reservación y será efectiva a partir de la fecha en que la reciba el Arrendador. Si la notificación es recibida antes de los 60 días naturales previos al inicio de este contrato, se le reembolsará al Arrendatario la totalidad del primer pago menos un cargo por administración equivalente a US$200.00 (doscientos dólares moneda de curso legal en los Estados Unidos de América). Si la notificación es recibida antes de los 30 días naturales previos al arribo del Arrendatario, se le reembolsará una cantidad igual al 50% del total del primer pago recibido. Si la notificación es recibida con menos de 30 días de anticipación al arribo del Arrendatario, no habrá reembolso alguno. Para Navidad y Año Nuevo no aplican cancelaciones. En el improbable caso que sea necesario cancelar la reservación por parte del Arrendador, debido a que la propiedad reservada dejara de estar disponible para su renta y no fuera posible ofrecer al Arrendatario una alternativa con características y condiciones equivalentes, el Arrendador reembolsará la totalidad del monto pagado con anterioridad. En caso de cambios o cancelación por Causas de Fuerza Mayor, debido a actos de guerra, motines, conmoción civil, huelgas, desastres, actividades terroristas, mal clima, actos de cualquier gobierno o autoridad pública, o cualquier otro evento público o privado fuera del control del Arrendador, este último no será responsable en ninguna forma. El Arrendador se reserva el derecho de modificar o retirar cualquier reservación debido a circunstancias ajenas a su control y no caerá en responsabilidad por cualquier pérdida, gastos, inconvenientes y/o reclamos por causa de lo anterior. La responsabilidad del Arrendador estará limitada a reembolsar cualquier monto que le hubiere sido pagado. Se recomienda ampliamente la contratación de un seguro de viaje, ya que el Arrendador no se hace responsable por gastos médicos, costos de repatriación, pérdidas o daños a la propiedad, responsabilidad civil, lesiones personales o algún otro gasto, pérdidas o daños del tipo que sería cubierto por una póliza de seguro de viaje. El Arrendatario requiere otorgar un depósito de seguridad para cubrir posibles gastos ocasionados por daños, pérdidas y/o abuso de la propiedad, su contenido, sus accesorios, mobiliario, enseres y/o equipo. El depósito de seguridad será determinado de acuerdo al período de estancia y a la propiedad en cuestión. El depósito deberá efectuarse al momento del arribo y será devuelto al momento de dejar la propiedad una vez que se haya hecho una inspección física del inmueble y se haya determinado que el Inmueble se recibió en las mismas buenas condiciones y de limpieza en que fue entregado al Arrendatario. El Arrendatario será responsable por el costo completo erogado por reparaciones o por compras de cualquier objeto para su reemplazo debido a negligencia, abuso, accidentes, pérdidas y/o daños. Cualquier daño, pérdida o malfuncionamiento deberá ser notificado inmediatamente al Arrendador, en el entendido que no hacerlo de esta manera, podrá ser razón suficiente para retener el depósito. La estancia es reservada solamente para las personas especificadas en el formato de reservación. Queda estrictamente prohibido al Arrendatario que alguna otra persona distinta a las señaladas se quede en la propiedad sin consentimiento dado por escrito por el Arrendador, asimismo bajo ninguna circunstancia se deberá exceder el número máximo de personas permitido y especificado tanto en la página de Internet como en el formato de reservación del Arrendador. La sobre ocupación no autorizada del Inmueble puede resultar en cargos, penalidades y/o la cancelación inmediata del derecho de estadía en la propiedad. El Arrendador se reserva el derecho de dar por terminada la estadía del Arrendatario en el Inmueble debido a mala conducta o mal comportamiento por parte de cualquiera de los inquilinos, sus invitados, y/o por cualquier falta al Reglamento Interno del Condominio en que se encuentre el Inmueble. Es obligación del Arrendatario informarse de las estipulaciones que conforman el Reglamento Interno del Condominio en que se encuentre el Inmueble y acatar los mismos. El Inmueble está equipado y amueblado para servicio del Arrendatario y para el número de personas estipuladas en el formato de reservación, y será revisada y aseada previamente a su llegada. El Arrendador se reserva el derecho de retener cualquier cantidad del depósito de seguridad para cubrir gastos adicionales de limpieza. El Arrendatario no adquieren ningún derecho de ninguna naturaleza, sobre la propiedad a excepción de su uso y goce únicamente durante el período contratado. El Inmueble no podrá ser sub-arrendado, ni prestado, ni total ni parcialmente. El Arrendatario podrá tener invitados solamente durante su presencia, tanto dentro de El Inmueble como en las áreas comunes del condominio y no después de las 11:30 pm. El Inmueble deberá mantenerse cerrado bajo llave durante las noches y cuando sea que los inquilinos no se encuentren dentro del mismo. El Arrendatario se compromete a conducirse con seriedad y a actuar de manera tal que no ocasione molestias inaceptables a los residentes del condominio ni a las propiedades vecinas. El Arrendatario reconoce que está reservando una propiedad que puede encontrarse ubicada dentro un condominio, y por lo tanto acepta que el Arrendador no es responsable por ruidos o molestias que los vecinos u ocupantes del mencionado condominio pudieran causarles, y que tampoco será responsable por ruidos o molestias causadas al Arrendatario en virtud de la operación ordinaria de la ciudad en que la propiedad se encuentra; puesto que estas circunstancias se encuentran fuera del control del Arrendador. El Inmueble estará disponible para ocuparse a partir de las 15:00 horas del día de su llegada y deberá estar desocupado a partir de las 11:00 horas el día de su partida. En caso que la propiedad no esté disponible a la hora estipulada con anterioridad, el Arrendatario podrá dejar sus pertenencias dentro de la propiedad y permitir que el personal de limpieza termine su trabajo lo antes posible, dejando la propiedad libre para este propósito. En caso que el Arrendatario desee desocupar la propiedad después de la hora estipulada con anterioridad deberá solicitarlo a su llegada, lo cual no significa ninguna obligación ni compromiso por parte del Arrendador. El Arrendador se reserva el derecho de retener cargos adicionales del depósito de seguridad, si la propiedad no es desocupada a la hora estipulada. El Arrendatario y demás inquilinos y sus invitados harán uso de las áreas comunes y alberca bajo su propio riesgo y serán en todo momento responsables de su propia seguridad y de la de sus invitados. Los Arrendatarios son responsables de informarse de las reglas, especificaciones y medidas de seguridad de las áreas comunes y albercas, antes de hacer uso de ellas y acatar y obedecer las reglas aplicables para su uso. No se aceptan mascotas en el Inmueble, salvo autorización previa y por escrito por parte del Arrendador. A menos que sea especificado de otra manera, el arrendamiento de la propiedad incluye agua, electricidad, gas doméstico, ropa de cama y toallas. En caso que se requieran otros artículos deberán solicitarse y pagarse previo a la llegada del Arrendatario para asegurar su suministro. La información proporcionada por el personal y por medio de la página de Internet del Arrendador, es lo más exacta posible de acuerdo a las condiciones en que se encuentran las propiedades. El Arrendatario reconoce que algunas características pueden cambiar por motivos ajenos al control del Arrendador, por lo que este último se compromete a informar al Arrendatario en el menor tiempo posible de la situación, y no incurrirá en responsabilidad alguna. El Arrendador no será responsable de ninguna manera o modo, por malas interpretaciones del material gráfico y/o escrito en la página de Internet del Arrendador, toda vez que las fotografías e información ahí presentada se hace con total apego a la realidad, pero con la provisión que el mobiliario, accesorios y/o enseres pudieran no ser los mismos a los ahí publicados. Trabajos de construcción y/o reparación en propiedades adyacentes y vecinas, pudieran resultar en ruido y/o polvo molestos para los Arrendatarios en cualquier época del año, por lo cual el Arrendador no será responsable de ninguna manera y/o forma, en caso que estos ocurran, así como tampoco lo será por el cese temporal del suministro de servicios públicos y generales, tales como agua, electricidad, cable, satélite, Internet, teléfono, etc., ocasionados por causas ajenas a la voluntad y control del Arrendador. Está estrictamente prohibido fumar dentro del Inmueble, por lo que en caso de hacerlo, el Arrendador se reserva el derecho de retener el depósito de seguridad para cubrir diversos gastos de limpieza y de remoción de olor y tóxicos producidos por esta actividad.